Is it really Dreaded Dengue?? Updated. Accidents apart, few situations are less comfortable for a traveler a little too removed from medical help, than to be shivering under a makeshift blanket, or lying on a twisted damp sheet in the dark, feeling well and truly awful. And if like me, you’re fighting off the menacing what-ifs that prey on the vulnerable in the dead of such nights, you’re in for a long haul to daybreak! By light of day, things tend to brighten up. In my case, after fruitlessly comparing Google images with my brand new rash, I knew I needed to head for a hospital, even if it meant leaving the relative comfort of a horizontal position for bumpy buses and boats, for a facility called Horus Insani…. It turns out I was in the beginning stages of typhoid fever, a much better lot I was told, than severe Dengue. Well hurray for that! Still, it was nothing an impressive assortment of meds and a few quiet AC nights couldn’t cure, for which I’m unconditionally grateful…. Of course there are no universal guidelines on what to do when illness strikes on the road, or, for that matter, when fate, in whatever form, challenges us. But there is intuition. Heeding its fleeting voice can seriously improve our chances of a Best Possible Outcome…. 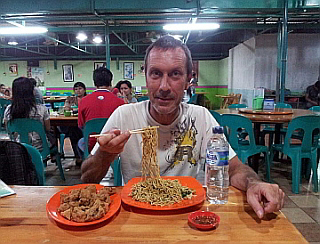 Great to see someone eating, @ Mega Seafood, Megaland, Pematang Siantar, Sumatra. Thank you. Update: Am back on Samosir Island, mending rapidly and feeling fine.